In order to fully meet the needs of the consumers in your service area, you must first have a thorough and detailed understanding of who they are. Only then will you be equipped to grow the appropriate service lines to accurately meet their needs. With Tapestry, the process of understanding the needs of your customer is a lot easier. Additionally, with this knowledge, you will then be able to target your marketing outreach to let the right consumers know about the services you have developed just for them. 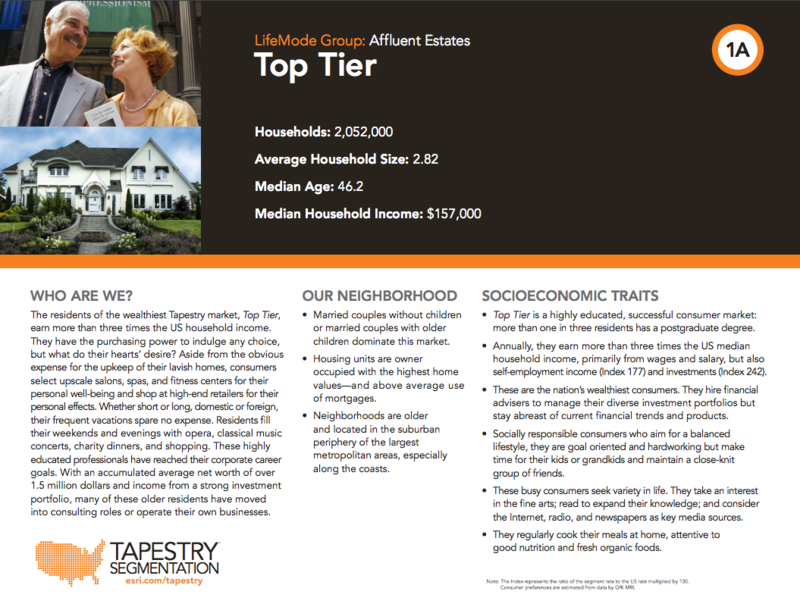 This post will specifically highlight Tapestry Segments in LifeModes that include the wealthiest households in America's Urban and Suburban areas. 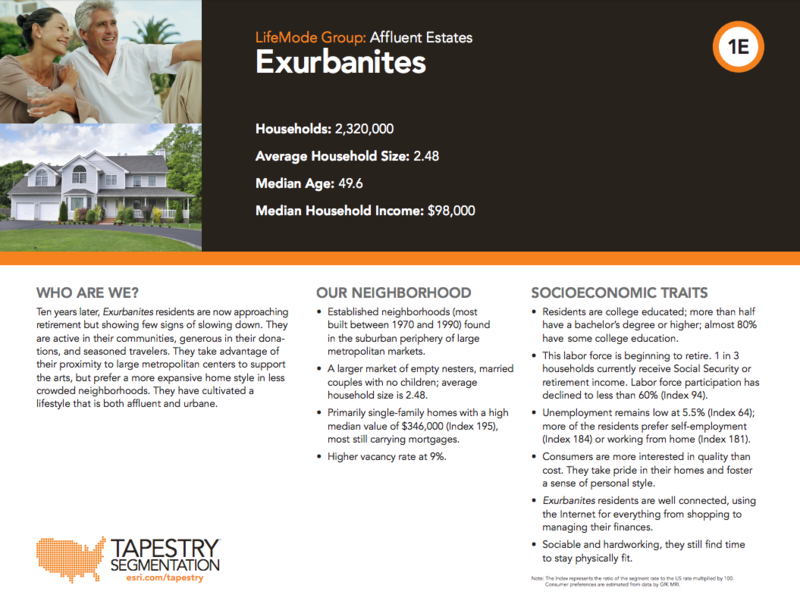 These wealthy LifeModes include many different ages from those in their early 30's to households in their 50's and 60's. 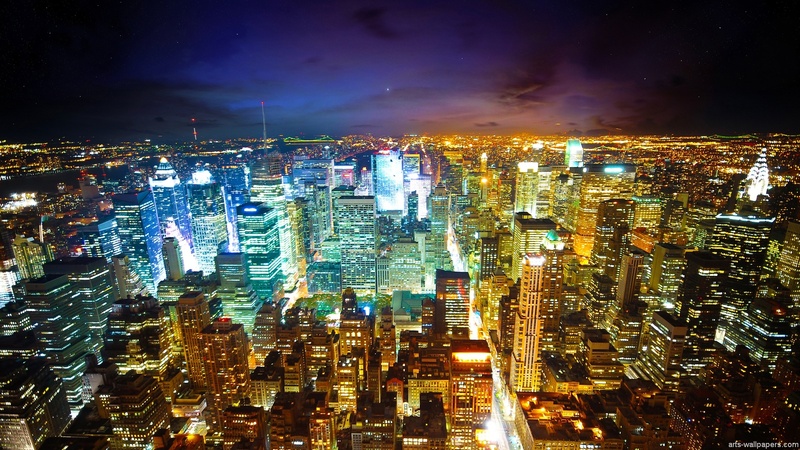 Although their ages can be quite different, it is their proximity to cities and their high median household incomes that make them quite similar. Furthermore, these households are much more likely to utilize Commercial Payor health insurance as well as seeking care proactively within their communities. By examining the makeups of these three wealthy LifeMode groups, we are able to better understand their behaviors, habits, who they are, and what they do. 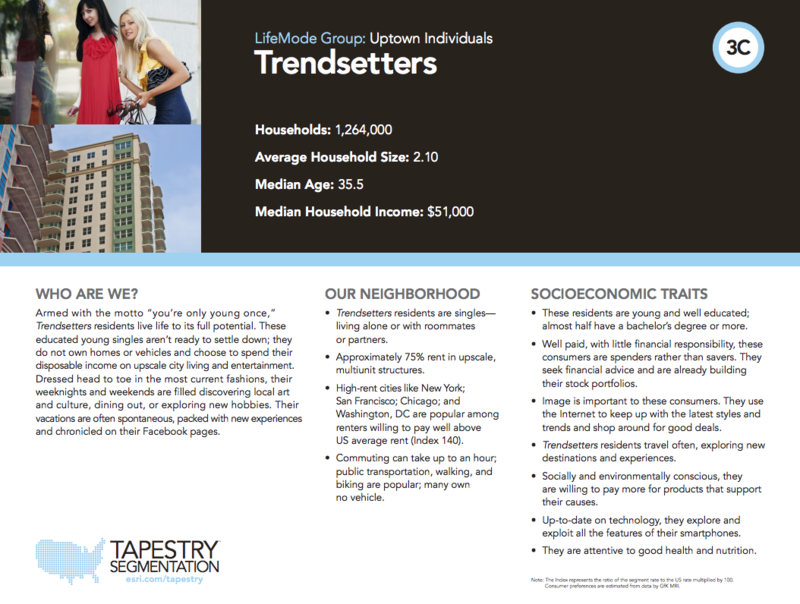 By taking a deeper dive into their specific Tapestry Segments, you will be able to target these populations in and around your markets. 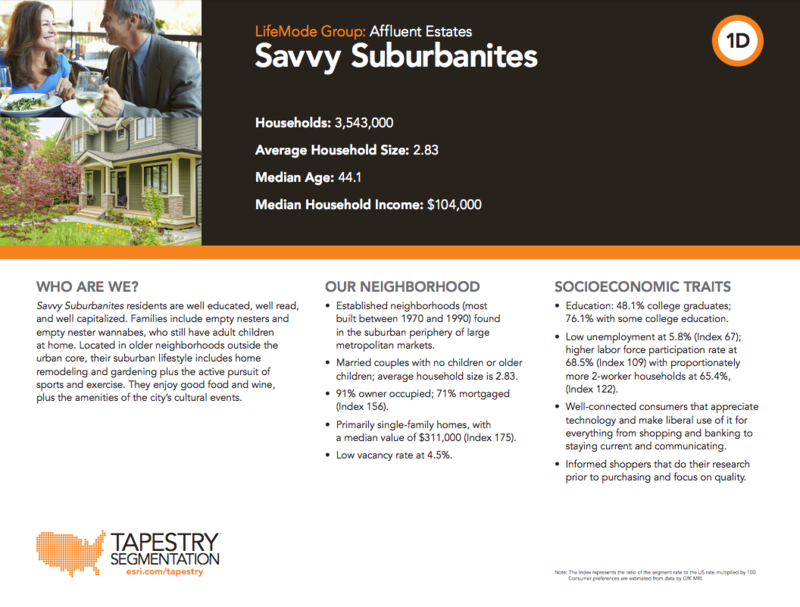 The Affluent Estates LifeMode contains five individual tapestry segments: 1A - Top Tier, 1B - Professional Pride, 1C - Boomburbs, 1D - Savvy Suburbanites, and 1E - Exurbanites. These five segments are all in the Suburban Periphery. The median ages of these segments range from 33.6 to 50 years old. 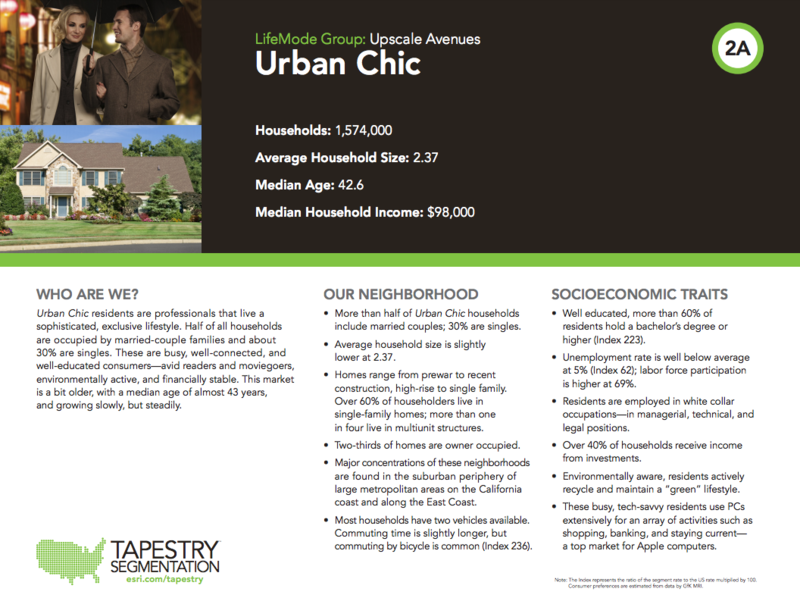 The Upscale Avenues LifeMode contains four individual tapestry segments: 2A - Urban Chic, 2B - Pleasantville, 2C - Pacific Heights, and 2D - Enterprising Professionals. These four segments are all in the Urban Periphery and the Suburban Periphery. The median ages of these segments range from 34.9 to 42.7 years old. 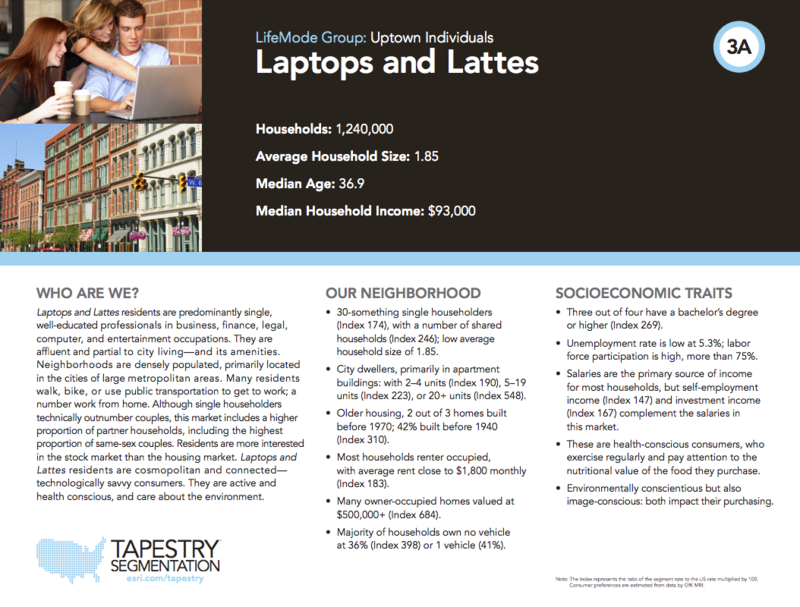 The Uptown Individuals LifeMode contains three individual tapestry segments: 3A - Laptops and Lattes, 3B - Metro Renters, and 3C - Trendsetters. These three segments are all in the Principal Urban Centers. The median ages of these segments range from 32 to 37 years old. 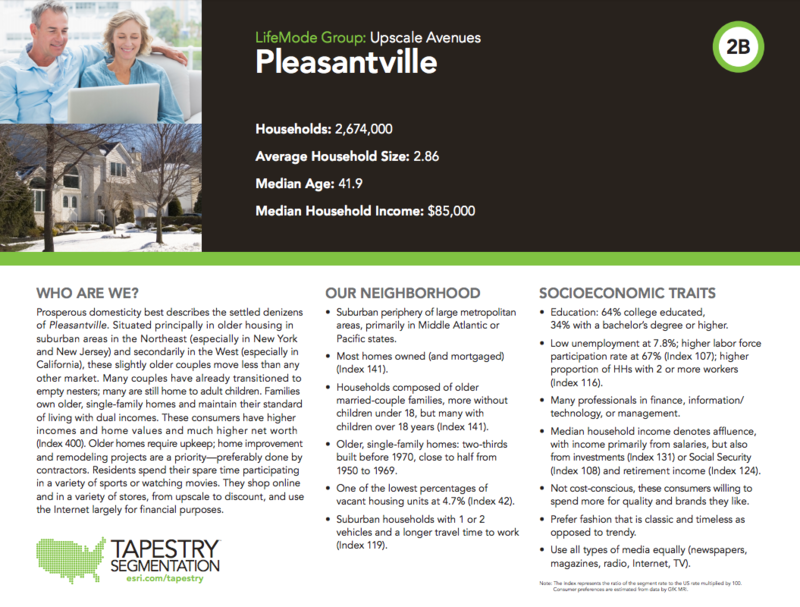 Since Tapestry Segmentation is so diverse and can be quite different depending on what part of the country you are in, we will be breaking out the segments within the many LifeModes over the course of this series. By the end of it, you will be able to identify and interpret the tapestry segments in your market and help coordinate your strategy and/or marketing outreach accordingly. 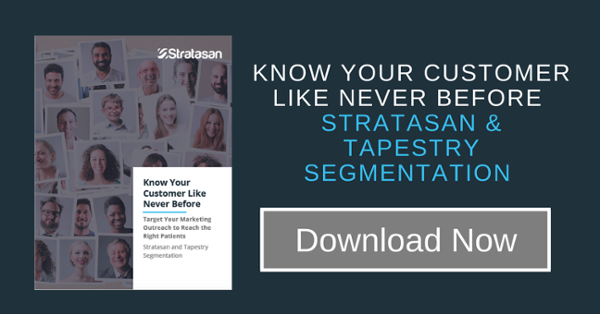 If you would like to learn more about Stratasan and how we can equip your team to use Tapestry Segmentation on your patients or market, contact sales@stratasan.com.